Ten years have passed since I first met the Sisters from Mara, Tanzania. What began as a remarkable coincidence- a shared name and interest in partnering around a school for girls https://marabhuber.com/2013/11/27/giving-thanks-for-my-name/ – has evolved into something difficult to describe yet undeniably powerful. And as we begin recruiting for the summer 2018 study abroad trip, I am eager to meet the extraordinary students who will both impact and be impacted by the journey. You see, the magic of this trip lies in the people who activate the opportunity, drawn in by their unique reasons and stories, ready to resonate in ways that they cannot and will not know. Much of the trip is in the design. Dan and I have created an itinerary brimming with contrasts and textures. From bustling Dar es Salaam to Mwanza, then winding around Lake Victoria before nestling into the Mara Region. Certain affordances are guaranteed- the beauty of the dusty roads, the smiling children, the wonders of the Serengeti and Ngorongoro Crater. 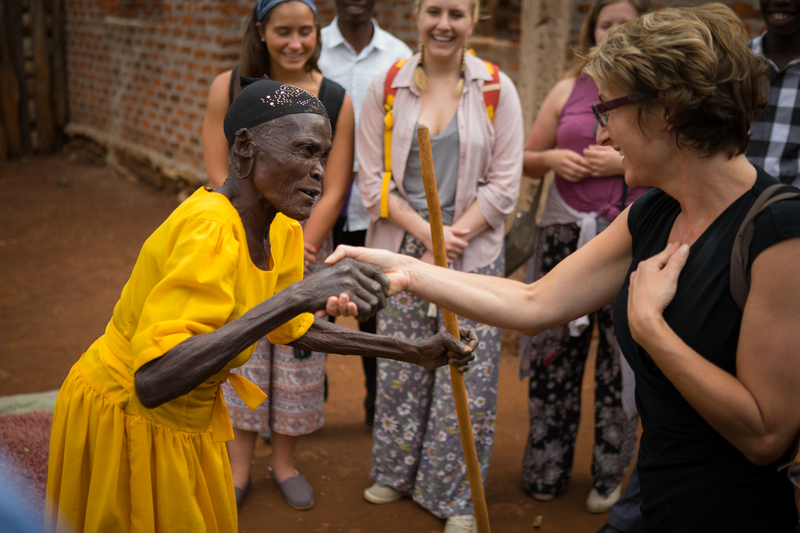 We visit with partners with inspiring lives and stories doing amazing work, eager to share and learn, warmly welcoming us with music, dancing and home-cooked meals. But other aspects of the trip emerge at their own pace and rhythm. Conversations over endless miles along bumpy roads; surprising moments with villagers or unexpected guests; poignant reflections over family-style dinners set against sunsets or twinkling night skies. These moments cannot be scripted or anticipated, nor can they be erased once the trip has ended. Indeed, the impacts of our last study abroad trip- summer 2017- are still taking hold, developing in ways that I couldn’t have imagined or planned. Danielle’s final project became a GoFundMe Campaign and is now evolving into a social innovation project, with plans for local women to sew and sell reusable sanitary pads. Research is being conducted, grants are being written, and the excitement is palpable as new collaborative projects develop and come to life. Over the years, the impacts of our visits and engagement have been impressive, but so are the personal and professional transformations of our students. As they refine their passions and sense of purpose, they weave their experiences into professional and academic goals, moving toward careers that will bring both impact and fulfillment. So what type of student is best suited for this trip? Certainly someone seeking a high-impact adventure, challenging their assumptions and moving them outside of their comfort zone; someone eager to learn, to increase their cultural competency and global knowledge; ideally someone with a sense of humor who enjoys people and new situations. The trip is open to students from all majors and programs of study. And while UB students are given priority, students from other SUNY and non-SUNY schools are welcome to apply. To learn more about the study abroad trip and our broader engagement initiative, please visit the fall edition of the UB Alumni Magazine http://www.buffalo.edu/atbuffalo/past-issues/fall-2017/article-page-fall-2017.host.html/content/shared/www/atbuffalo/articles/Fall-2017/features/african-connections.detail.html or browse through Tanzania-related posts on this site. Photos for this post taken by UB Photographer, Doug Levere.